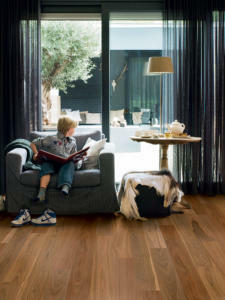 There are so many brands of engineered timber flooring available. We have selected just a handful that we feel are of the highest quality for our clients. They offer beautiful, yet practical finishes in a style to suit everyone to live on, not around! Are we a busy family coming & going all the time or do we have a smaller footprint (literally) & rarely at home? Shoes on or shoes off inside? What kind of sub-floor do we have? A level & moisture regulated sub-floor is vital for the longevity & structural stability of timber flooring. Is the environmental conditions of the heating & cooling systems on site suitable for timber flooring? Is minimal weekly dry cleaning & spot cleaning & then fortnightly-monthly damp-mopping realistic for my schedule? Timber is a natural product & will mark, dent & scratch over time. The coating seals the surface & rarely improves the hardness of a softer timber. Floating Timber Floors are not all made equal. It’s really important to check where they come from, who makes them & what they’re made of. If the floor is stained, but can be sanded back to raw timber in the future, this will take away the surface colour & need to be completely re-done? Timber oxides over time. Coating is UV Resistant, however, full exposure to western sunlight & heat can cause colour & structural changes over time. • WILD RIVER TIMBER COMPANY Engineered 1800x189x15mm European Oak manufactured in Mongolia with a prime coat factory finish. Available in extra featured & recycled, extra long & extra wide boards or customise. Engineered 888x158x15mm boards for Herringbone Parquetry Design. 25 Year Structural Warranty. 7 Year Under-floor Heating Warranty. Please contact us for guidelines. Direct Stick installation. Apply Oil & buff in after installation. • BIG RIVER Group These Australian made products have been manufactured in Grafton since the early 1900’s. 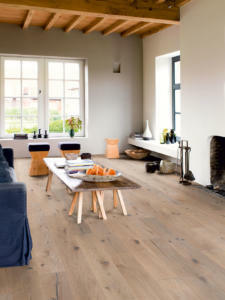 They are fully warranted over floor heating & are the most stable timber floor products available on the market. They are installed RAW & then the coating of your choice is applied. This is a forever floor. We have loved living on it in our homes & know you will too. Direct Stick or Floating installation • QUICK-STEP Readyflor Engineered & Prefinished timber comprised of 3.2mm top layer of species, Hevea (Rubberwood) core & Spruce backing manufactured in Malaysia from Sustainably managed forests. Available in Australian, European & Exotic Species in 1, 2 & 3 Strip. 7 layers of Matt Brushed, Matt, Silk or Gloss SRT laquer & some species available in RAW product. Each board is unique with variations in colour & feature. Direct Stick or Floating installation. • QUICK-STEP Palazzo European Designed Uniclic Engineered 1820x190x14mm Oak boards with bevelled edge on length sides & Matt Lacquer factory finish. Compatible with under-floor heating. Lifetime Warranty. Direct Stick or Floating installation. • QUICK-STEP Imperio Uniclic Engineered 2200x220x14mm Oak boards with Rustic Character & all 4 sides bevelled with 2 layers of Oil factory finish. Compatible with under-floor heating. Lifetime Warranty. Direct Stick or Floating installation. 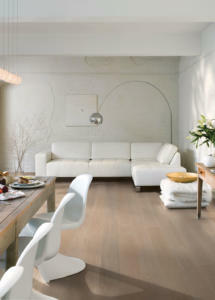 • QUICK-STEP Variano Uniclic Engineered 2200x190x14mm Oak boards are unique in every way. Matt Lacquer factory finish. Aged edges & cracked knots, saw cut structures & variations in colour & dimensions. Compatible with under-floor heating. Lifetime Warranty. Direct Stick or Floating installation. 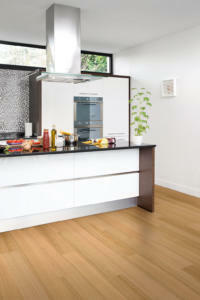 • PREMIUM OAK This range has 8 lovely colours, some that are stained & natural at a great price point. Engineered 1820x190x14mm UNICLIC boards with a bevelled edge & Matt factory finish. Lifetime structural warranty. 25 Year Wear Warranty. • OUTLAND Series Exclusive Hybrid product at a fantastic price point available in Blackbutt & Spotted Gum with a Matt Brushed surface. Please contact us for details. 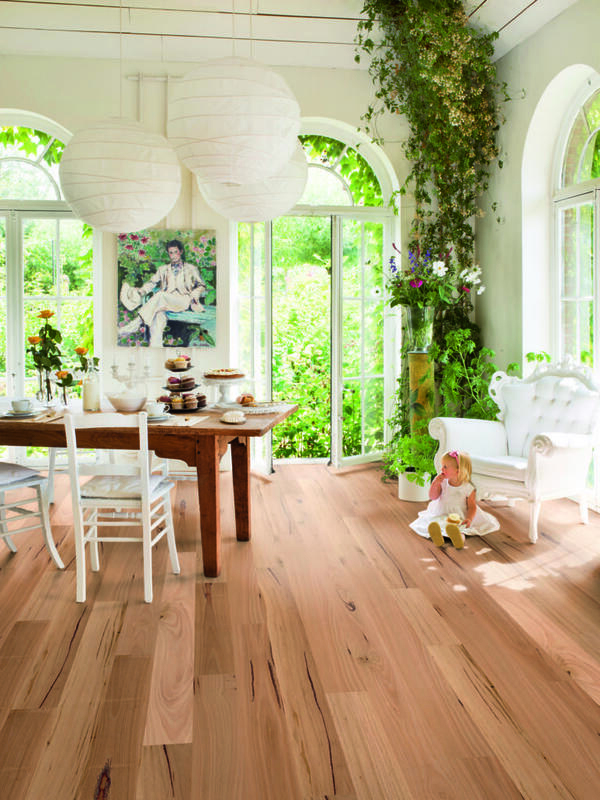 • The HERMITAGE Prestige Oaks Beautiful extra wide boards in a range of colours & textures. Engineered French Oak 2200x240x14.4mm with a Matt Klumpp Finish & bevelled edge. Valinge Lock system. 25 Year Warranty. • GRAND OAK Pre-finished Matt Engineered Oak Flooring. Lifetime Structural Warranty, 20 Year Wear Warranty. T&G with PVA Adhesive for Floating installation or Direct Stick installation • TIMBER FLOORS Au Naturale Engineered Australian, Exotic & European Species available in many sizes & finishes. Direct Stick installation. • WILD OAK Superior Grade French Engineered Oak manufactured in Indonesia with Hevea Core & Spruce available in Matt lacquer or Oil finishes.HABITUE & ETENDU Series available in extra long & wide boards. Direct Stick or Floating installation. • GODFREY HIRST FLOORS Regal Oak Handcrafted, Naturals, Oakden • LAKEWOOD Series Engineered European Oak1900x190x14mm with 5Gc Valinge Lock, 8% Matt Klumpp Lacquer. Lifetime Structural Warranty. 20 Year Domestic Wear warranty. Direct Stick installation.